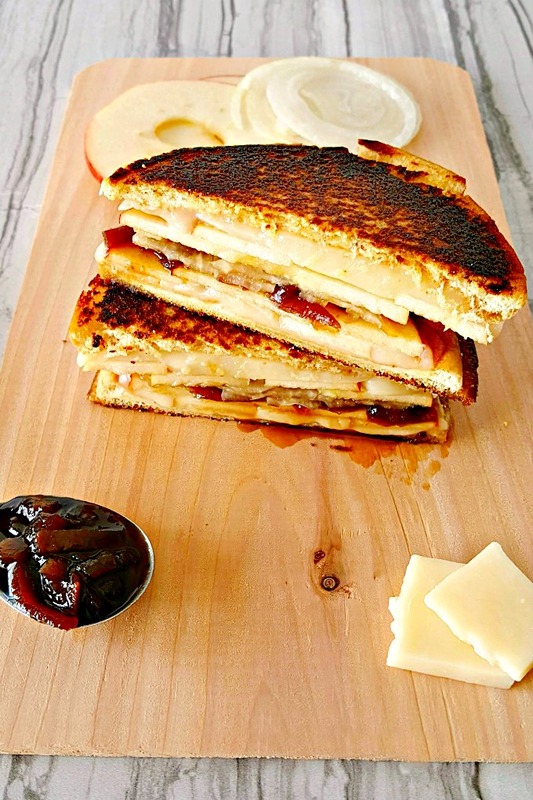 Apple Cheddar Grilled Cheese is fall in a grilled cheese. It has crisp and crunchy apples, sharp and creamy cheddar, and sweet and delicious caramelized onions. 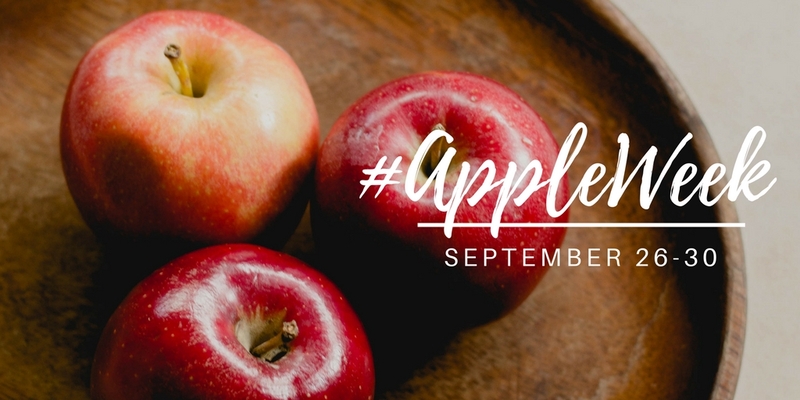 Did y’all catch yesterday’s intro to #appleweek? If not, then you need to check it out. There were some really great drink and appetizer recipes. Including my Mulled Apple Shrub Mule. You have got to check it out. So, head on over. Meanwhile, I’ll wait for you. See what I mean?? Anyway, day two of #AppleWeek is all about main dishes. That immediately took me to a day recently where the hubs and I headed to our favorite winery, The Winery at Bull Run. This has become our new go to spot and we love bringing friends and relatives there for a tasting and a bite of lunch. If you’re in the area, give me a call and we’ll take you there one afternoon. Preferably early so as to beat the crowds because it gets packed quickly. On the weekends, they usually have a food truck parked out front. You can order from the truck, buy a bottle, and just chat the day away. Then again, you can get some cheese and crackers, salami, or sandwiches from their kitchen. However, on this particular day, we opted for the food truck The Frenchman. After checking out their menu, I purchased the hubs a Napoleon the Angry sandwich. Then I ordered a large Mon Frites (fries to die for), an order of baked brie because who can pass that up, and for me I ordered a Hamilton. Honestly, what sold me was the Cabot cheddar. If there’s Cabot in it anywhere, then I’m going to want to eat it. And I did. And it was delicious!! Now for those that are new to my blog might not know that I don’t usually like sweet and savory together. There are no pork with apples recipes. You wont see any apricots or figs with chicken. The only sweet I do with savory is barbecue sauce. That’s about it. Thus, for me to not only eat this sandwich and like it so much I want to recreate it is monumental. As a result of both of these events (#AppleWeek and The Frenchman lunch) I had to create a sandwich that captured the memory with a few additions. In my September Degustabox, I received some delicious chutneys. There was a caramelized onion one that screamed to be in on this sandwich making process. Honestly, I think it’s the reason this sandwich came into being so soon. It really wanted to be in on this delicious dish. I have to say that the first attempt was okay. For those that swear by using mayonnaise instead of butter for the bread are off their rocker. I tried it. It didn’t work for me. Round two was a less firm bun, less juice from the onion chutney, and voila! Lunch was awesome on Saturday because round two was perfect. And perfectly delicious. It’s a delicious Italian bun that’s flipped inside out. Meaning, the outside is inside and the inside is coated with butter and put on the outside. I love this technique. Second, there’s the crisp Envy apples. I couldn’t believe I saw these babies at my local grocery store. If you haven’t had Envy apples, run to your store and get some. They’re amazing! Third, I melted some amazing, Cabot cheddar. It’s reduced fat, so you can use a little extra and it’s still going to taste fabulous. Finally, there’s the sweet onion chutney from English Provender Co. They were the final touch I needed to make this sandwich amazing. Just look at all those layers of delicious goodness. They apples are crunch, the cheese is sharp, and the onions are sweet. I added some raw onion to mine for a little extra crunch and bite, but that’s totally optional. See that melted cheese? Those thin slices of apple? That sweet onion chutney? You just know this sandwich is packed with amazing flavor, crunch, and texture. It’s definitely one that we’ll be making again soon!! Have you made a apple cheddar sandwich? Spread 1 teaspoon of butter on the insides of the four buns. Place a bun, butter side down, into the pan. Place a few slices of cheese on the bun. Top with two thin slices of apple, 1 tablespoon of onion chutney, two more slices of apple, a thin layer of cheese and the other half of the bun. Cook until golden brown and the cheese has melted. Flip and cook on the second side until golden brown and the cheese has melted. Cool slightly before slicing and serving. What an awesome looking sandwich! The food truck/winery combo sounds perfect too! Thank you, Carlee! It really is a win win. This reminds me of ploughman’s platters that you’d get in traditional English pubs for lunch – looks great! I’ll have to look into that, Caroline! Thank you! I think this sandwich sound amazing Christie.